The Cottage is beautifully appointed with a mix of antiques and modern pieces, plus luxury bedding, linen and towels. In addition to a queen-sized bed, there is a Danish designed couch which converts into a comfortable double bed, and extra linen can be provided upon request. Enjoy a barbeque under the spectacular old fig tree, or cuddle up in front of the fire place. Feel free to pack a picnic and stroll around the farm - there are many beautiful spots to relax. If you enjoy fishing, bring a rod and catch some Bass or Perch on the property at the confluence of Byron Creek and Wilsons River. We have long been passionate foodies and having an interest in growing food and farming was a natural extension for us. Traveling through India, South East Asia and Europe; WOOFing in Tasmania and Italy; and living in Sri Lanka and London was largely focused on exploring the local food cultures. Inspired by the growing attention on provenance, artisanship and food ethics that we experienced while living in London and exploring Europe; we solidified our desire to live on the land and be involved in sustainable food production. We chose to move to the Byron Bay Hinterland as it was a progressive regional area with stunningly beautiful natural surroundings where we believed that we would find a community of like-minded people. There were great farmers markets and you could still get good bread, pastries and coffee. We loved the proximity of the property to all the region has to offer. We fell in love with this farm as it seemed like to perfect place to implement our dream of creating a really productive sustainable farm. It is 120 acres of fertile river flats, boarded by the Byron Creek and Wilson River. It was one of the original dairy farms in the area, and already seen as a bit of a community gathering place which we really loved the idea of. We are currently breeding Angus-Wagyu beef cattle using cell grazing to manage the land sustainably. We have plans to continue diversifying our agribusiness with new ventures in the pipeline. Our long term vision is to create a mixed farm system which integrates plants and animals in a way that builds soil health and acts as a carbon sink while producing healthy nutrient dense foods. The Cottage is a unique and beautiful building with rustic charm and stylish country decor. It has a great kitchen with everything you need to cook a delicious meal. The pastoral views and tranquillity are restorative. While feeling miles away from anywhere, you are still only a short drive away from the regions top destinations. Brand new bathroom. Large shower with luxurious ceiling mounted rain shower head and full glass screen. Stylish subway and hexagonal mosaic tiling. Lovely pedestal sink. Incredibly scenic 30 minutes drive to Byron Bay main beach and various other stunning local beaches. 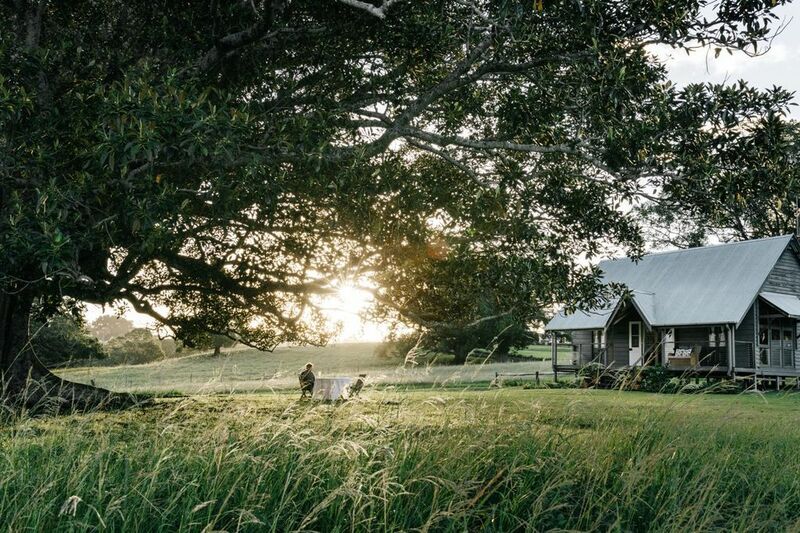 Located on an idyllic 120-acre farm in the Byron Bay Hinterland with uninterrupted views of rolling green hills. 10 minute drive from the vibrant Byron Bay Hinterland village of Bangalow - with great markets, shops and cafes. Beautiful cast-iron wood burning fire place that provides exceptionally efficient warmth that fills the entire cottage. Drawer-style Fisher & Paykel dishwasher. Coffee, milk, flour, sugar, oil, vinegar. Everything you need to whip up a gourmet meal. Fully stocked. A gourmet cook’s kitchen: custom-built designer kitchen with 90cm gas oven and 5-burner gas stove top; plenty of bench space; all the utensils you'd ever need to cook a gourmet meal. French-country style circular table made from recycled elm wood. 4 blue and white ratten Parisian cafe chairs. A magnificent two meter-square northeast-facing window. TV with built-in DVD player. A range of classic movies on DVD. Beautiful cottage in a picturesque setting, generous hosts, convenient location in the Byron hinterland close to scenic drives, village markets and beaches. We loved our stay. Very relaxed and had everything we needed. Delightful cottage in a country setting. Jeanie has thought of everything! Beautifully set up, especially if you like to cook. Cosy, warm, romantic, clean & beautiful... We loved this little cottage and will be back! Only feedback would be to have curtains / blinds on all the windows. Nashua is a beautiful hinterland hamlet offering peace and tranquility with stunning pastoral views. It is just 10 minutes drive to Bangalow, the most popular destination in the Byron Bay hinterland due to its historic village charm and great collection of boutiques, cafes, restaurants, and markets. Byron Bay itself is just a further 10 minutes on, offering spectacular beaches and fun-filled holiday vibes. There are countless other destinations in the Byron Bay Hinterland worth exploring. The hinterland is a truly unique destination, offering a blend of stunning natural beauty with character-filled villages, fabulous food scene, diverse shopping, numerous markets, abundant health and wellness experiences, and jam-packed cultural events calendar. The region is artistic, progressive and community-oriented. The beauty of the landscape is jaw dropping and diverse, from incredible mountains and forests to lush, green farmland; and magnificent beaches and coastlines.